Jemele Hill suspended for violating social media rules. No, not even ESPN Talent has free speech rights. ESPN pays the National Football League nearly $2 billion annual for digital rights. Two billion dollars! With so much at stake, that’s an investment worth protecting. A few years ago, former ESPN personality Bill Simmons found that out the hard way. He was suspended by the network for his incendiary comments on his podcast about the NFL Commissioner Roger Goodell. And yesterday, ESPN SportsCenter anchor Jemele Hill learned a hard lesson about online accountability too. Regardless of whether you agree with Ms. Hill’s position, what transpired here reaffirms what I’ve said before — especially as it relates to the NFL. That is, employees in the private sector, such as NFL players or sports reporters, have no First Amendment right to free speech. Conversely, employers like ESPN may have policies and procedures that regulate what employees can say and do — not just on the clock, but on their own time. Think before your tweet. Understand that at all times you are representing ESPN, and Twitter (as with other social sites) offers the equivalent of a live microphone. Simple rule: If you wouldn’t say it on the air or write it in a column, don’t post it on any social network. Any violation of these guidelines could result in a range of consequences, including, but not limited to, suspension or dismissal. Put it all together and I can think of a number of reasons — about 2 billion of ’em — why ESPN would choose to enforce its rules here against Ms. Hill. Whether your biggest customer accounts are in the billions, millions, or thousands, those relationships matter. So, does your workforce. And social media guidelines help strike that balance. That is, social media guidelines are not meant as a direct attack on your employee’s right to free speech. Indeed, free speech notwithstanding, employees can use social media (or any other form of communication) to discuss working conditions with one another. Otherwise, these guidelines remind employees that whatever they say or do online — even on their own time — ultimately reflect back on their employer. And just as an employee is free to leave the company of it doesn’t like the company’s culture, mission, or goals, the converse holds true. If your company wants to have social media rules or guidelines, it may. 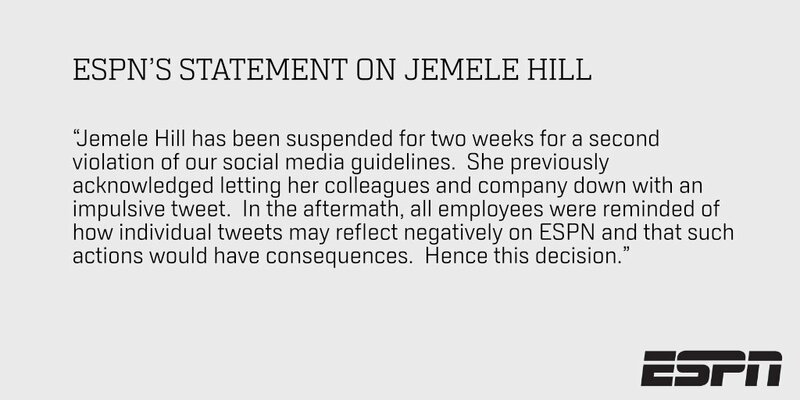 Here, ESPN has clear social networking guidelines and Ms. Hill ostensibly knew them. If your company has them too, make sure employees know what they say and mean. Thereafter, your company has every right to hold employees responsible for what they say or do online.